My Mummy's Pennies: Frugi are coming to you!! 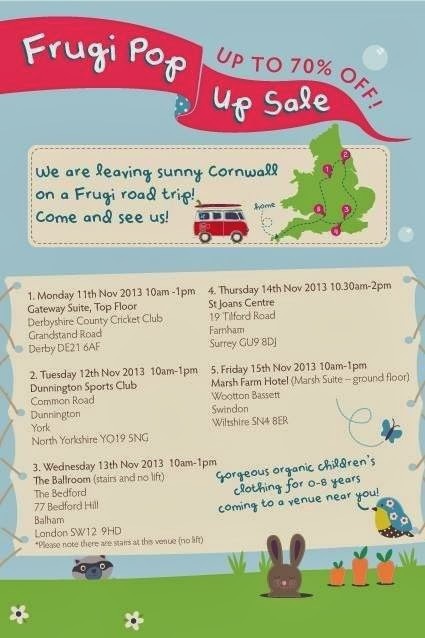 Frugi are coming to you!! I first discovered this Cornish Organic Children's Clothing brand when my daughter was wearing cloth nappies and I was looking for clothes that were cut for cloth, but even now she has been out of nappies for a while both my children are still kitted out in Frugi! The funky and unique designs that stand out from the high street offerings are not just pleasing to the eye, they are hard wearing too! From climbing tree's to jumping in muddy puddles, rolling down hills and what ever other messy states that children get in to, my two have done it all in their frugi gear, yet wash after wash it still looks great! And it's all organic too! I have to admit the prices are higher than I would usually pay for children's clothes but the generous sizing and great quality mean that I am prepared to spend that little bit more! Saying that though as you know, I'm always on the hunt for a bargain and if you live near Derby, York, Balham, Farnham or Swindon then the Frugi bargains are heading your way! They are leaving sunning Cornwall and are going on a road trip this November to bring you sale stock at up to 70% off! Wow! If like me you aren't near enough to grab theses bargains, do not fear! You can still get 15% off current season offerings at www.welovefrugi.com with discount code BORIS. Frugi offer FREE standard UK delivery and accept paypal too! If you manage to get to one of the pop up sales, do come back here and let me know what you bought! I'd love to read about your Frugi loveliness! ooooh, I do love the look of their clothes.